Satoshi Dice first entered the Bitcoin gaming community, in April 2012, and became the first blockchain dice game that dealt specifically with Bitcoin, before Bitcoin had become what it is today. As the Bitcoin industry grew throughout the following years, up until today’s time, so has the Satoshi Dice brand and it’s evolution as one of the premier Bitcoin dice games a player will find online. From its humble beginnings, Satoshi Dice has been one of the premier dice games that has evolved into its extreme popularity today and has adapted to change quite well over the past three years, since its introduction. Satoshi Dice brings with it the security, longevity, and its overall trustworthiness that many players have come to respect. Satoshi Dice has proven that it is a mainstay in this Bitcoin gaming industry and will be that way for many years to come. 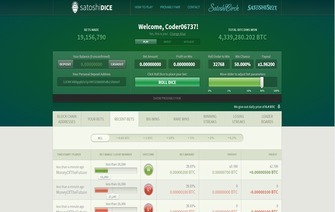 “Welcome Satoshi Dice, the first Bitcoin Dice game. The new game gives you the possibility to place off chain bets that are blizzard fast and visually stunning. Bets are returned in ~20ms and there’s daily leader boards and a cutting edge provably fair system. With the new system, there’s no account needed for playing. You’ll automatically be given your personal URL that is saved in a cookie. Set your user alias, deposit some coins an roll away! Affiliate earnings are given to you in real time. All bets and wins by players referred by you are immediately counted towards your account and you can withdraw at any time you choose. Just lean back and watch your balance increase. SatoshiDice.com is the world’s most popular Bitcoin casino site. Over 4,000,000 BTC has been won and over 6,000,000 individual block chain based bets placed. Bet options are available with up to 64,000x multiples and a house edge of only 1.9% (bet results are mathematically provably fair). To play, you just send coins to any of the listed addresses based on the odds you want. SatoshiDice BitcoinGame – Bet Bitcoins with SatoshiDice Bitcoin gambling. The Satoshi Dice game play was very simple in how it is laid out for players to interact with. When it first was established in early 2012, a player would send the amount of Bitcoin they were willing to wager with, to a specific Bitcoin address associated with the winning percentage chance they so desired. For example, if player A sent one Bitcoin to an address that had a 48% chance of winning, they would receive two Bitcoins in return, one as their original bet and the second as the winnings, if they were to have won the wager. If player B sent one Bitcoin to an address that had around a 73% chance of winning they would receive 1.25 Bitcoins back, 1 as their original bet and .25 for the winnings, if they had won. Each bet received used the popular “Provably Fair” verification, in order to determine a winning or losing transaction. Players had to have a wallet that was capable of being sent a return wager, so they were able to receive winnings, if they were to have won. As time had progressed and Bitcoin was getting more popular, Satoshi Dice changed how players were to play within the site. Today, when players want to play on Satoshi Dice, they simply send the amount of Bitcoin they would like to deposit and make wagers through their balance, instead of sending each bet as a transaction, which makes it simpler for both sides. Players are able to set the payout or percentage they would like to risk playing on, or the number that they would like to roll either higher or lower than. This makes it more advantageous to players that want a specific setting to how they are wanting to wager their Bitcoin with. Satoshi Dice has a bunch of interesting features that are unique to their site, about the history of other players bets and history of bets on the site itself. They provide a category that is personal to the player, but the rest of the categories are the totality of the Satoshi Dice network of players. They have Big Wins, Rare Wins, Winning Streaks, Losing Streaks, and a daily leader board for their daily .4 Bitcoin giveaway. The advantage to having these features is two-fold for the players and the Bitcoin industry, altogether. The more open and willing a Bitcoin gaming site is to the players and public, the more trust that is built within the network and Satoshi Dice provides that. Add to that, the fact players enjoy seeing the statistics as a way of having a little more fun, when they are wagering. The only evident downside to Satoshi Dice is the restriction it upholds when it comes to I.P. addresses originating from the United States, or in jurisdictions that have stricter online gaming protocols and limitations. This is to both protect Satoshi Dice and the players themselves from getting into any legal trouble as a gaming operation. Deposits at Satoshi Dice are as simple as you will find, although the withdrawals are a bit confusing, if a player doe not read how to execute them. When a player first visits Satoshi Dice, they are given a unique URL, that they will need to keep, in order to play with the same account. The deposit address is associated with that URL and if by chance the URL is lost, chances are the balance within the account, will be lost. As for withdrawals, they will be sent back to the same address that the deposit was made from, unless otherwise specified within the account. Each deposit is credited within one confirmation and most withdrawals are sent instantly to the blockchain, once requested. A support request at Satoshi Dice can be initiated through three different ways. The first is through an email sent to their support email address. Second, is throught the Bitcointalk forum, by sending them a private message. Lastly, they offer a Bitmessage encrypted message address through which a player can receive support. Through our own requests, support has never taken more than about twelve hours, although on the weekend and holidays, may take a little longer. Usually there are no problems though, except very minor ones or the occasional maintenance that is done, so support is usually rarely needed. As mentioned in the game play section above, Satoshi Dice uses a “provably fair” verification for their players, so that everything can be verified by both site and player. It is the industry standard for sites set up in the manner that Satoshi Dice has been created. For as long as Satoshi Dice has been open, since April 2012, it has been nothing short of what a site needs as far as being able to provide players fun and also being able to be trusted within the Bitcoin community. It has been a staple within the Bitcoin gaming industry, and that will most likely never change. It provides players stability that a Bitcoin gaming site needs, along with a good support team, and the overall willingness to make all wagers public. The only drawback that Satoshi Dice has is the restriction of certain countries from accessing the site, although its for players and its own protection. If a player is not from one of these countries though, it is highly recommended they give Satoshi Dice a roll of the dice. They might end up seeing themselves on the rare win category, like a user did a couple years ago on a .03 Bitcoin bet that won over 1,900 Bitcoin. Bonus Only session game streaks that have at least 1mBTC (0.001 BTC) average bet aize are processed. The reward for winning is credited to your account at the end of each day! You will also win badges that are assigned to your account for each Leader Board Win.